Among the favorite dahlias at Lynch Creek Farm are the ball, miniature ball and pompon dahlias. These fully double dahlias are all characterized by their dense complement of tightly rolled ray florets that impart a fully rounded shape to the flowers. They're great garden dahlias, and as cut flowers, they last incredibly well, making them a favorite with florists and growers who want to show off their dahlias in bouquets and arrangements. 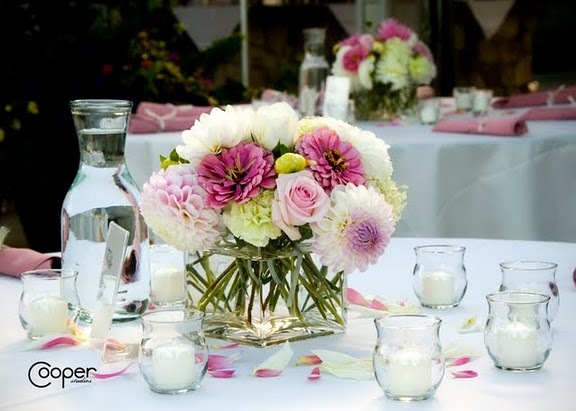 You'll often see them in wedding bouquets and arrangements. Miniature ball dahlias and pompon dahlias are popular for drying, and pompon dahlias are considered the right size for corsages and bouttonieres. The ball-shaped dahlia was first developed and grown in the early 1800s, not long after the new introductions from Mexico were popularized in Europe and in England. Variously called "show," "ball" and "fancy" dahlias, they were popular at garden exhibitions. Their formal appearance made them one of the few dahlias that were grown seriously in the herbaceous borders of stately English homes. Miniature ball and pompon dahlias were developed later and added to the catalogues in the 20th Century. In 1895 the ball dahlia was one of only four forms of dahlia being shown and acknowledged by the Royal Horticultural Society. 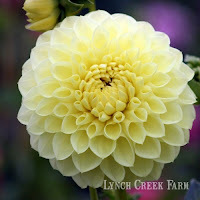 The RHS currently defines the ball dahlia as having "fully double blooms, which are ball-shaped or slightly flattened. The ray florets are blunt or rounded at the tips, with margins spirally arranged and involute for at least 75 percent of the length of the florets. 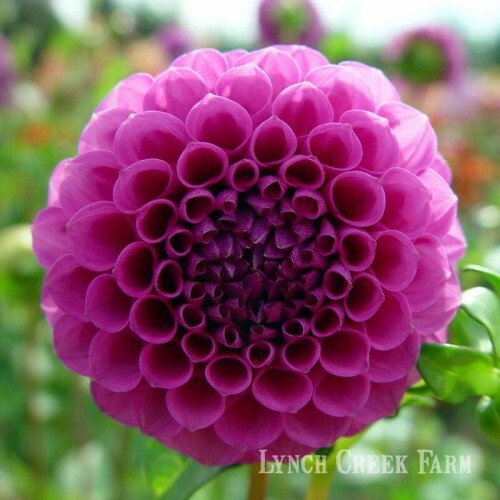 Ball dahlia flowers are 3.5 inches or more across; miniature ball dahlias measure 2 to 3.5 inches in diameter, and pompon dahlias, among the smallest of the dahlias, are less than 2 inches or 5 centimeters across. At the farm, these round dahlias are big favorites. The gang has grown Polyventon Supreme, a soft yellow ball dahlia with long, strong stems and big 5-inch blooms, for years. Barbarry Gem is another farm favorite, with deep burgundy flowers. It's a miniature ball, with a bushy growth habit if it's pinched back, great for the garden border or landscaping. Similarly, pompon Mary Munns, a three-foot plant with tight, bright lavender flowers, makes a showy display in the garden. The small blooms are firm and weather-resistant, and great for arranging, as in this wedding table arrangement captured by photographer Amy Cooper of Cooper Studios. 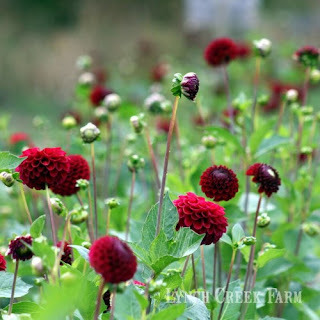 Not many new pompon cultivars have been developed in recent years, according to dahlia guru Bill McClaren. "This form should be a focus for hybridizers," he observes. "The pompon's diminutive size makes it ideal for bud vases, corsages and small bouquets. It is the favored dahlia for drying."